Antonio Margarito won't be fighting in the United States for at least a year thanks to a unanimous ruling by the California State Athletic Commission yesterday afternoon. State inspectors testified that they confiscated two gauze pads that were "firm" and "smeared with a substance" before Margarito made the first defense of his welterweight title against Mosley on Jan. 24 at Staples Center. Mosley won by a ninth-round technical knockout. The pads, shown in photos to be caked with a white grout-like substance still under analysis by a state lab, were inserted covertly under the knuckle pads atop Margarito's fists, a fact that his trainer, Javier Capetillo, admitted could have injured Mosley. The suspension will be upheld by other state commissions all over the country, which means that the next time you see Margarito in a ring it will most likely be under Mexican jurisdiction. However Margarito will still have to re-apply for a license a year from now, and skirting the ruling by fighting in Mexico might not sit well in Sacramento. Somehow I don't see that possibility stopping Margarito's promoter Bob Arum from cashing in on a payday, possibly in Margarito's hometown of Tijuana where the local hero can seemingly do no wrong. The main question left unanswered is whether this was an isolated incident, and you can bet that Miguel Cotto's support team will be looking for answers. 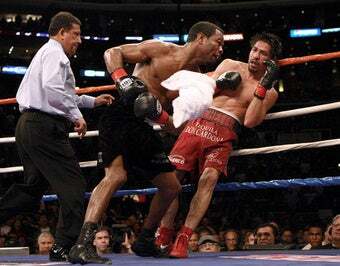 At one point during yesterday's testimony California's Deputy Attorney General Karen Chappelle attempted to claim that Margarito had similarly loaded gloves that went undetected last year when Margarito knocked out the seemingly indestructible Cotto in Las Vegas. Her claims were immediately dismissed, seeing as how that fight took place outside of the commission's purview. For now Cotto remains quiet, but if Chappelle has any tangible evidence he'd probably be interested in seeing it. For much more on the Margarito suspension check out the coverage over at No Mas and The Queensberry Rules.